I am a subscriber to your feed through google reader, and I have actually not been getting updates made to your feed up until today (so all of a sudden I had precisely 10 unread updates) -- then I read your post about the google stats for feedburner, so I think maybe the two are related. Today I see a drop of over 1, 000 readers from my normal count of Google subscribers. 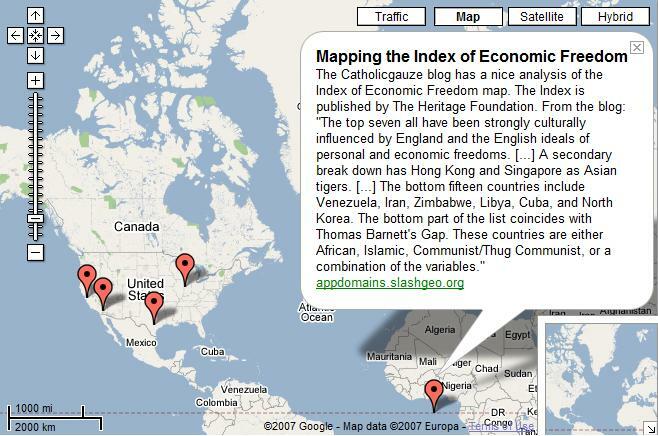 A little while after Google reader launched, some improvements to the system garnered considerable positive commentary. I wonder if the system is having scalability issues (not in the number of readers, but in the number of feeds perhaps). If anyone else is having problems with reading in Google reader, please leave a comment - if you can read this, that is! Chris Riley has posted an interesting site to the backstage mailing list: BBC Touch. What the site does is compare the news stories on the front page (which are described as the stories the beeb 'wants' us to read) and compares these with the most popular (most read) stories based on the most read stories RSS feed (this is described as the stories 'we' want to read). On top of this, some key term extraction is done via the Yahoo term extraction API. The site is definitely fun, however, one needs to have a bit more perspective as to the function of the BBC and its relationship to other news media services. Research by Ethan Zuckerman demonstrated that the global coverage of the BBC news (that is to say, the distribution of countries in articles published by the BBC) is quite different from that for other (US based) media. Note that currently, Ethan is not supporting his Global Attention Profile research page, so you may have to dig a little to get the details. Secondly, one has to be careful in interpreting popularity. The BBC has a clear obligation to provide informative and broad coverage to the nation (and the world). Guiding news via popularity is in part an admission of news-as-entertainment which is a very slippery slope. Remember the BBC is not a commercial enterprise. I've been using Bloglines for a while now and though I'd registered at a number of other sites, I've never really used them. Today that changes. The reason that I've decided to switch to something else is that, although there are many features of Bloglines that I like, there are more that simply don't work. These have become too annoying so I'm moving on. Inaccurate reporting of fresh material: Steve Rubel doesn't really write 30 posts a day, but Bloglines is always telling me that my subscriptions have new posts even though, when I visit them, there is nothing there. Navigating my folders: folders are important, but Bloglines, at least as I experience it in linux/firefox simply doesn't present them well at all. The names of the folders and the presence of absence of new posts, are often hidden and I need to scroll the frame around to see if there is anything to read. Non trivial OPML exporting: ironic that this would be a reason to leave, but I find the path to exporting OPML from my own account poorly designed - so much so that I'm sure I've missed something. The only way I know to export my own OPML is by going to a view of my account as others see it. Bookmarking posts: it is a great way to collect posts for further reading and blogging. The 200 post limit: this limitation is a good one - when I see a feed reaching this limit, I know that it is losing my attention and a candidate for deletion. So far, I've looked at two alternatives. The first is Attensa's free online service. It pretty much fell over when I uploaded my OPML. The foldering structure doesn't appear to be there (which is weird, when you consider OPML). In addition, many (most) of the feeds haven't come through and are stuck with a 'downloading...' place holder. The second that I have looked at is Rojo. I looked into this very early on and didn't really do much with it. Now, however, I find that I'm really starting to like it. It had no trouble uploading my OPML; the folders are all there, I can read the name and status of all the feeds; the reading space is very nicely designed. I'm going to keep with Rojo for a while and see if it sticks. Shel Holtz writes about the frustrations of being in the PR world where measuring the results of actions is a prime focus on selling new ideas, but where the ability to make accurate measurements, and the ability to determine what to measure is of secondary concern. My feeling is that the blogosphere (actually, the whole gamut of online personal media, or open media) offers something else to measure without there being any inherent features that result in better measurements. This is why consumer facing products, such as BlogPulse, Technorati, OpinMind, while having a great role in attracting people to the space, cannot, without adult supervision, really be used when betting the farm. 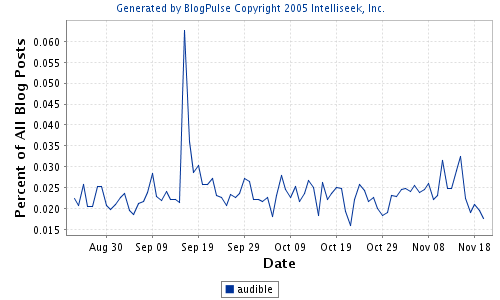 Will users consider when and how new blogs are added to the index when looking at Technorati's absolute count trends? Will they really take seasonal variation into account when looking at a 30 day window? Will users moderate OpinMind's positive and negative counts with a known background of precision and recall for each category of opinion? On a related note, calls like this for better consumer services indicate another level of disconnect between the users and the pragmatic, technical world of web 2.0. To think that those working in blog search (and, let's face it, everyone working in this space is working the enterprise angle as well) have not been considering comment search is ridiculous. This is precisely why I wrote my When Worlds Collide post earlier this year. 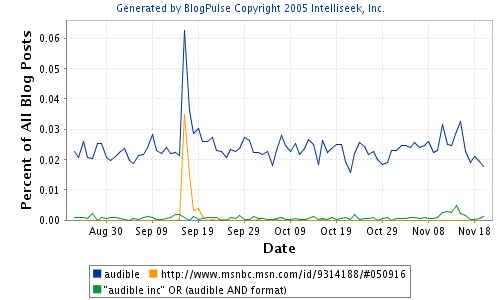 A great enabler of blog search has been the RSS-ping duo. There is only one blog publishing software which currently allows a good RSS based comment stream. 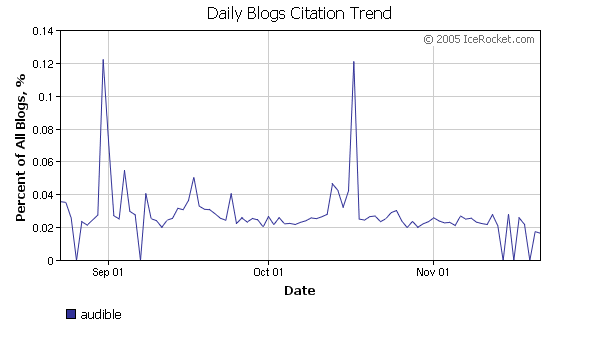 Getting to the time granularity of Technorati for comment search is a reasonable engineering challange. Consider this in the face of the scalability challanges that consumer facing blog search engines have faced and overcome this year. What is needed is not just the right motivation, or someone to grant us the vision, but some platform alignment and modifications to infrastructure. Of course, having said that, there is an opportunity for a blog hosting system that also provides blog search to lead the way here. Such combinations, however, for some reason tend not to be leading the pack in terms of innovation. Having got there, the problem of understanding when comments indicate an interesting conversation and when they don't is going to add another layer of complexity which will lead in many misguided inferences being made. Many A-list bloggers turn comments off to remove certain types of work load. Are their posts important? 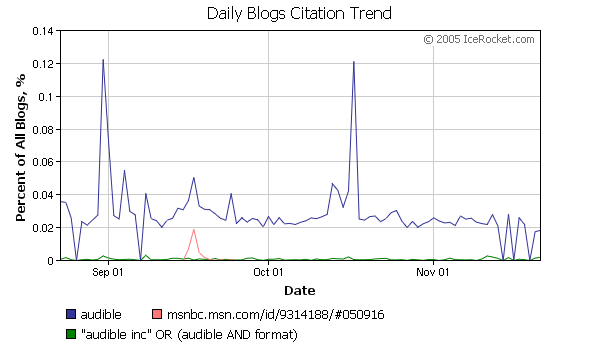 What is more likely: Steve Rubel created 75 new posts in the last 4 hours, or Bloglines is getting its feeds in a twist? Much as I appreciate the creative output from Mr Rubel, my money is on Bloglines. Recently I have found that the feed reading portal has been all over the place in terms of quality and yet has stood still in terms of development. The interface tells me there are no new messages for a certain feed. However, when I click on the item, I do see new messages. The interface tells me that there are new messages for a certain feed and when I look, they are all old (as in the case above). In addition to these quality issues, I'm somewhat at a loss to understand why they haven't developed any of their features or provided any new ones. Why am I still sticking around? Because Bloglines doesn't provide a simple way to export OPML! Every now and then, something turns up in one's referer logs that points to some new product or company. 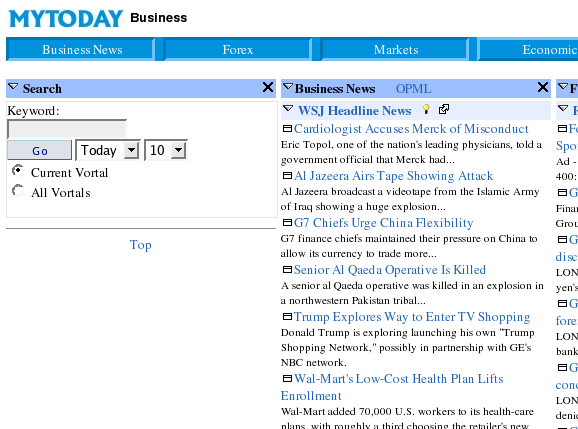 Today I see 'w.mytoday.com'. From what I can tell, it looks like another RSS reader. The home page provides links into the following categories: Business, China, City Buzz, Education, Entertainment, Food, Fun, Gaurav Agarwal, Headlines, Health, India, Mobility, Rafat Ali, Rajesh's Feeds, Recipe Collection, Search, Software, Sports, Technology, Telecom, Top 100, Travel, Wellness, Wireless. There are some names in there that may point to where this project is from. For what it's worth, I really like the interface. Very simple, very intuitive. Each tab brings up a collection of feeds for that topic. Clicking on the feed name opens and closes the titles and snippets for that feed. Update: It seems that Gaurav Argawal and Rajesh Jain are both IIT. Update: Netcore Solutions, which launched Blogstreet, India, owns mytoday.com, so I'm guessing it's a new product from them. They certainly seem to be in the right space.